Newcomb Heating & Cooling provides air conditioning, heating, and home performance services to the residents of Carterville, IL and the surrounding areas. Read our reviews and find out why your neighbors consider us to be the experts for HVAC repair, replacement, and maintenance in Carterville, IL. Great service! Pleasure doing business with. Ryan was a pleasure dealing with. Honest and knowledgeable. gas furnace wouldn't fire up right and he figured it out pretty quick. new gas valve. he also heard a gurgle and figured out water was not draining right as well. all from a small tube. And the gas valve was replaced in no time. very pleased with the service provided to me. When my old heating and cooling guy went to a new job, I asked for a recommendation and he gave me Ryan's name. I called and they were very accommodating with my appointment and they showed up exactly when they said they would. My system is 29 years old so I thought I would probably have to buy a new heat pump. Ryan knew exactly what the problem was and he knew my system inside and out. I was in awe of his work! I can't say enough wonderful thing about them. My system was fixed and and it purrs now. So efficient and I still love my Trane heat pump. They gavel top notch service and my bill was shockingly affordable. I wouldn't hesitate to call them again and I'm sure I will. When the time comes to say goodbye to my Trane, I'll call Newcomb Heating and cooling. IAgain, I can't stress enough how happy I am with them. Sprayed 1” of closed spray foam on a garage pole barn. Closed cell spray foam insulation. Arcoaire heat pump not heating correct. Bad capacitor and low refrigerant. Checked defrost settings. Added freon. Removed a boiler system. Turned gas on and started the pilot light on the hot water heater. Trane ac is not cooling. There was no freon. The refrigerant had leaked out and the compressor would not start. Changed the entire system out with a Arcoaire 2.5 ton R410a heat pump system. Installed a new arcoaire air conditioner. Old ac was leaking refrigerant. The freon needed to be upgraded. High efficiency 92% furnace. York ac is not cooling well. System is also leaking water in the basement. Air conditioner needs freon. Drain pan is rusted out. Txv was bad on a arcoaire system. Changed out the capacitor and the txv. Arcoaire system is working great. Arcoaire air conditioner was not cooling correctly. Ordering a txv and will return to install when in. Spring check up on York system. System needed new capacitors and some R22 refrigerant. Janitrol furnace would not ignite. Hot surface igniter was not working. Replaced the control board and everything is good to go! York ac was not cooling. Added freon. 10 lbs of R22. Replaced blower motor, cleaned condenser and added 2 lbs of freon. Ac was not cooling. Air conditioner was not cooling. Outside unit would not run. Lennox system was low on freon. 5 ton Arcoaire heat pump system had a bad run capacitor. We put a turbo 200X on and charged with 3 lbs of R410a. 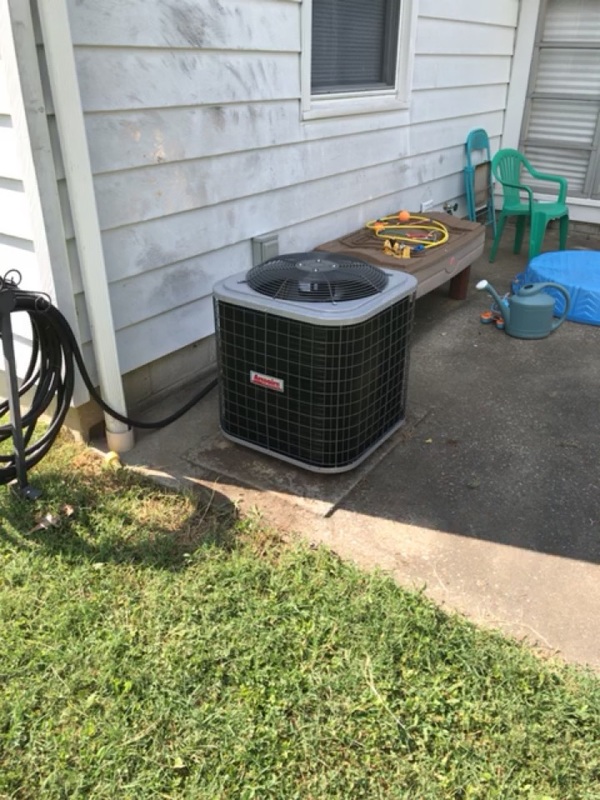 Trane heat pump had a bad low pressure switch. Jumped around the switch to check the rest of the system. Checked the refrigerant and it was charged correct. Did a spring tune up and serviced the Ruud air conditioner. Cleaned the condenser coils, checked amp draws, checked the capacitor and checked the refrigerant charge. Services and cleaned a train air conditioner. Did a spring tune up. Getting ready for summer. No heat because of a bad gas valve on a Carrier two stage gas furnace. Replaced the gas valve with a Honeywell universal gas valve. Serviced the system and changed the air filter. Cleaned a evaporator coil on a Trane system that would not heat. Also found a bad capacitor on the heat pump condensing unit. System is back up and running correctly. Had to schedule a evaporator coil to be cleaned on a Trane system. The system was getting to hot and the limit switches were turning the heat strips on and off. We will be back in the morning to pull the coil and get it working correctly.